Tregan Borg reviews Mr & Mrs..
Say hello to Mr & Mrs P, a relatively new and seemingly welcome addition to Bay Street Brighton. The wine bar/bar/eatery was almost full on a Tuesday night, an indication that the locals have already taken well to this evening hang-out. The atmosphere is warm, but not so dim that you can’t see your food or your friend. Interior is definitely on trend with exposed brick walls, blonde wood and matte black steel. Over two levels Mr & Mrs P provides choice in dining/drinking experience whether it be standing, seating or mingling. Downstairs you will find a long bar (predominantly bar stool seating), a floor to ceiling booze display, and a traditional hand spun meat slicer, with its sidekick whole leg of prosciutto. Upstairs offers a more formal dining area, tables, bentwood chairs, and a fireplace, always a nice touch. The kicker is a cute courtyard, still undercover, heated keeping you dry, and warm heading into the winter months. The menu is clever, and covers a range of cuisines without being too muddled. It’s a menu where XO Mussels (XO sauce being a very Chinese ingredient) sits comfortably next to a Butter Lettuce & Buttermilk Fried Chicken. Is it almost modern Australian? Possibly, if anything gearing more towards Asian flavours, there are some interesting dishes that present as contemporary and fun. Designed to share you can either graze with a wine, or order several bigger plates for a fulfilling dinner (still with some wine). I would have happily eaten every dish on the bigger plates menu, which always makes ordering so much more of a difficult task. As a result, the decision was made to completely bypass snacks allowing room for an extra bigger dish. Immediately Potato, Chorizo and Smoked Paprika Croquettes ($16) jump out of the menu, and were flying out of the kitchen, a clear winner if there were a people’s choice award. But, (cue shock horror) we didn’t order the croquettes, sorry Ela Carte, I know I’ve let you down. What we did order was the Kingfish, Truffle Soy and Fermented Wakame ($19). 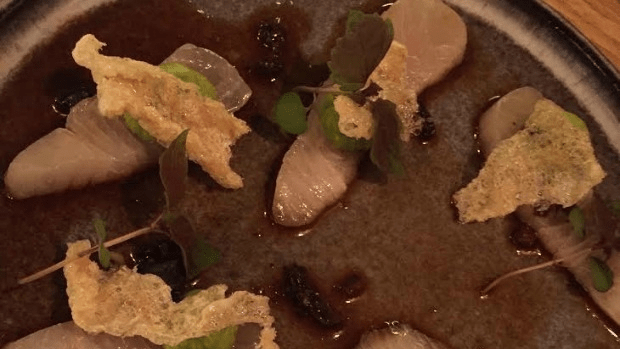 This Nicely portioned (not cut painfully thin) pieces of kingfish, dressed in a truffle soy complementing the light flavour and texture of kingfish with a strong salty savoury hit of flavour. Spicy prawn taco, served in a butter lettuce leaf ($15), initially I was slightly disappointed to see it on a lettuce leaf? Um, that’s not a taco! Luckily it redeemed itself with the fact that the prawns were lightly dusted and deep fried providing crunch (phew, crisis averted). The prawns were dressed in a spicy old bay style mayonnaise, with a nice little amount of heat. The creaminess of the dressing, crunchy texture of the prawn and fresh lettuce leaf worked, and less carbi-nes isn’t always such a bad thing. Zucchini Blossoms, Eggplant and Dukkah ($18), strong in Middle Eastern flavour, with lots of cumin through the eggplant which was soft and smokey. 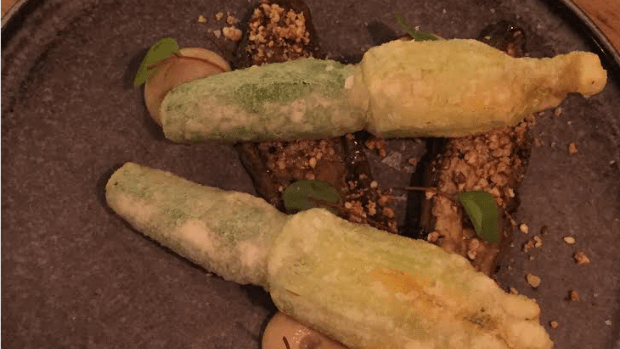 The zucchini flowers themselves stuffed with a light goats curd, and tempura battered. Beef short rib is one of my ‘not-negotiables’ when it appears on a menu, so of course we ordered it. 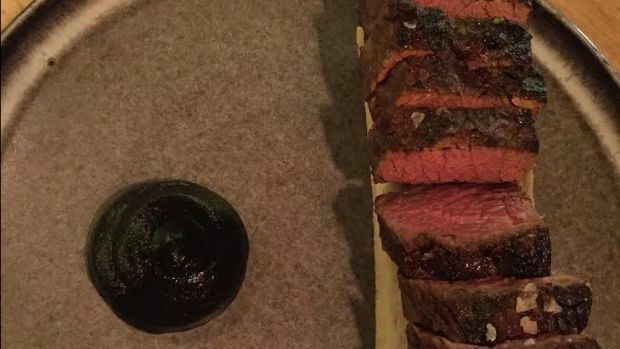 Interesting plating, the meat almost pressed, off the bone, cooked beautiful, seasoned well, sliced and served a top the bone from which is was originally removed from. The black bean and burnt carrot puree to look at looks dark, deep and deep in flavour. So what did we sacrifice snacks and croquettes for, and was it worth it? A big yes. 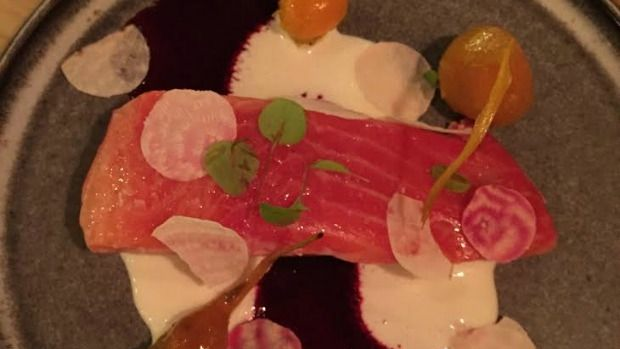 The Pink Trout, Horseradish and Beetroot ($21) was a standout dish. I can only describe it as so much pretty on a plate. Pink trout poached to perfection, it flaked apart wonderfully, yet still maintaining an almost translucent texture. I can only assume some kind of water bathing sous vide method was involved. The beetroot reduction was thick and sweet, and the horseradish cream provided the creaminess. The little shards of candied radish were an interesting and surprising touch. There was a lot of sweet on this savoury dish, but reasonably well balanced. There is a strong cocktail list (two pages) and a build your own Bloody Mary option. The wine list isn’t extensive but appropriate and well thought out, and you can grab a glass $10. Options on tap include Mrs. P lager, which is one of the newest to come out the Coopers brewery. All of the dishes we ate were consistently great. The service was as warm as the atmosphere and attentive without too much fluff . Prices are a little bit up there, but geographically relevant. A really great neighbourhood eatery offering the locals an experience. If you are lucky you might even come across Mr. P or Mrs. P who will share not only their hospitality but their ultimate love story of hospitality and each other? Open 4pm-11pm Tuesday ? Sunday.